Jerry Jones isn’t a believer. In spite of growing evidence, and even the revelatory admission from a top official from the NFL, Jones doesn’t believe there’s a link between chronic traumatic encephalopathy, or CTE, and football. “We don’t have that knowledge and background and scientifically, so there’s no way in the world to say you have a relationship relative to anything here,” Jones said during NFL meetings, according to Pro Football talk. “There’s no research. There’s no data.” The New York Times believes the NFL is acting just like big tobacco in their denials. Jones is not a doctor. Not a scientist. He’s merely the owner of the Dallas Cowboys and, outside of Commissioner Roger Goodell, arguably the most powerful man in the NFL. Jones believes there’s not conclusive evidence despite congressional testimony by NFL senior vice president of health and safety Jeff Miller, who agreed that there is research that shows otherwise. A week later, Jerry Jones isn’t convinced. Yet Kevin Turner was. And he paid the price. Turner died at home Thursday, surrounded by his family, after battling ALS since 2010. He was 46. The disease ravaged his body, but never his mind, leaving him with the inability to speak or to move freely. But it never robbed of the ability to think for himself. 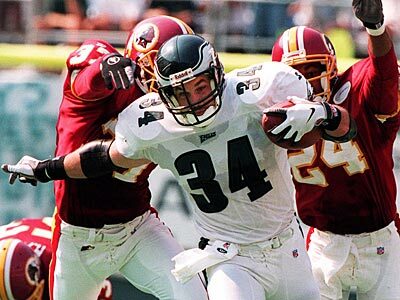 A fullback at the University of Alabama and with the NFL’s Philadelphia Eagles, Turner accepted the diagnosis and began working with others to fund research into ALS and its causes. He never wavered from his belief that repetitive brain trauma was the overriding factor in the disease that took his life. In 2012, Jon Frankel eloquently told Turner’s story in the documentary, An American Man. Turner was the lead plaintiff in a class-action lawsuit against the NFL, which accuses the league of hiding the dangers of head injuries. Yet Turner never blamed the game of football. He never blamed the doctors who treated him. He never blamed anyone. In fact, when his eldest son, Nolan, wanted to play the game, Turner encouraged him to do. He will next fall, as a scholarship freshman at Clemson. His head coach will be Dabo Swinney, Turner’s teammate at Alabama. Kevin Turner spent the final years of his life seeking answers. In death, he may provide some because he agreed to donate his brain and spinal cord after his passing. Kevin Turner believed there is a better, smarter, safer way to play football, the game he loved. No matter what Jerry Jones believes, believe in Kevin Turner. It was his body. He took the hits. He knew the impact. He experienced the pain and frustration. He believed because he knew. May his courage lead to answers.